I am happy to be a part of the Tempest blog tour put together by Books Complete Me & Once Upon a Twilight! 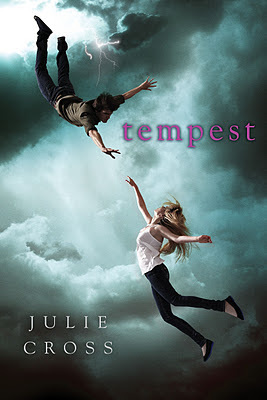 I was darn lucky to get a signed copy of Tempest at ALA this summer and meet author Julie Cross. Everyone has been buzzing about this book ever since. So, here is my review, a teaser from the book, and a chance to win 1 of 5 signed copies! For nineteen-year old Jackson, time travel doesn't seem to have many benefits. He can't go into the future and get winning Lotto numbers. He can't see who will win the next World Series. Why? Poor Jackson can only go into the past. And at first, only a few minutes into the past. Not very exciting, huh? Jackson and his friend Adam (a total genius) have been calculating what his (in)abilities all mean. After a terrifying break-in where his girlfriend Holly is murdered, he jumps two years back to 2007...and he can't seem to get back. Tempest takes on a new spin to time travel. There are different ways to travel and different places to go, branches almost. It is all sophisticated, but not too complicated. Cross uses analogies to help us wrap our brain around the idea of going back in time and being unable to change anything. She does an excellent job at keeping explanations simple yet putting her own stamp on it all. She also helps us keep track of 2007 Jackson and 2009 Jackson by changing up the look of the page. Usually Jackson will make a journal entry about the date, but the pages themselves have stripes on the side letting the reader know a change in year/time was made. Again, no confusion for me. I appreciate the time and effort made to keep the reader in the right place. There are a lot of characters in this book. Each one has a unique voice and most go through some sort of transformation. We are led to believe one thing about Jackson's father, then everything changes. Is he just a dad who works a lot, or something more....dangerous? Same goes for a few others. I have to admit that not all seemed necessary, but I am thinking some of these people will show up in the future (pun intended). I hope so! I really enjoyed the honest portrayal of Jackson. Cross didn't shy away from the physical relationship between Jackson and Holly. They are 19 and like it or not, most older teens in a long-term relationship have relations. Nothing too explicit, but very believable and authentic. I would have liked to know Holly a bit better. Everything is very clear with Jackson considering it is his point of view. I hope we learn more about Holly and her past or even what that ______ was doing in the ______! Bombshell towards the end alert! I feel like that was glossed over and not talked about again, but it is a perfect set-up for book two. The last thing I saw was Chief Marshall's face up close as he examined mine. I don't know what freaked me out more...the look in his eyes or the greedy smile that was snaking onto his face as I jumped out of 1996. Click HERE to enter to win 1 or 5 signed copies!!! Be sure to click I Read Banned Books. You must leave a comment on THIS post in order to be eligible. You can do this same process for every stop on the tour! Good luck!